Welcome to our Cape Town Massage School page, here you can check the available dates for our Cape Town massage courses and book online. Train with us to work as a Raynor Massage Practitioner in this dramatic and welcoming city. In Cape Town we offer both our Certificate and Diploma intensive massage courses so you can train to work in just 5 or 10 days. Learn more about our 5 day Certificate Course and 10 day combined Certificate and Diploma Course. Taking the Diploma course in Cape Town also qualifies you to attend our 6 day Advanced Diploma Course. ontinued teaching in South Africa due to restrictions placed on shorter courses being provided by foreign training providers by the Allied Health Professionals Council of South Africa. This is a shame for the people of South Africa but not unexpected from bureaucratic bodies that seem to care more about protecting vested interests and stamping out natural therapies to protect pharmaceutical companies profits rather than caring about people’s health and providing meaningful employment and small business opportunities for South African citizens. This is not good for South Africa by stopping people to learn to massage in one of the world’s most effective styles of massage therapy that can be practised in almost all other parts of the world. However, we are offering our courses right across the border in Windhoek, Namibia as well as in Australia, New Zealand, Canada, the UK and the United States. 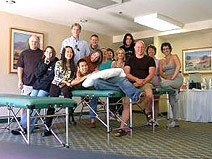 Please see our page Massage Courses in Namibia for more details of our courses coming up in Namibia. 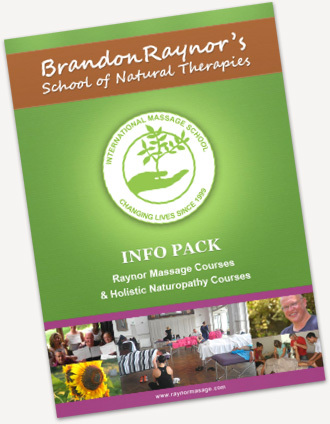 This 5 day intensive course teaches all the basics about Raynor massage and is recommended for people wanting to get an introductory taste in Raynor massage. Prior to attending the course, I had been given a massage in the Brandon Raynor style once before, so I thought I knew what to expect. Wrong! I had assumed that the course would be largely devoted to teaching us some fixed sequence of techniques and then having us execute these by rote; a sort of “work by numbers” approach which I had encountered on other massage courses. This was not to be. As well as learning the basic sequence, we were encouraged to use touch and intuition to finds bands of tension in the areas of the body we were working in and then to follow these through the body – a truly holistic and full body approach which really resonated with me. What I also found hugely refreshing was the aspect of making the client an active participant in the massage. Rather than being a passive blob being manipulated by someone else, the client was encouraged to engage with their breath and to mindfully co – operate with the therapist in the entire process. Instead of concentrating on the purely mechanical execution of the various maneuvers, our instructor (Jo) reminded us to cultivate a deep awareness of the client’s needs and feelings and to work at all times with empathy and compassion. This does not imply that the actual technique of the massage was neglected! Jo was extremely rigorous in her instruction of the details of exactly how, where (and why), to apply pressure and what intensity that pressure and duration should be. If we didn’t execute a particular stroke or pressure or stretch properly, we were made to do it again until we got it right. There was simply no consideration on her part that “almost right” would do. We were all absolutely forthright in our feedback to each other about what we experienced while being massaged so we were very soon made aware of any shortcomings in our techniques and could correct them. After a couple of days had passed, we were all able to honestly say to each other that our experiences had changed from a sensation of being inexpertly fumbled with, to that of feeling we were in capable and compassionate hands. During the course, we discovered that the power of this technique can sometimes elicit quite strong emotional responses in the client – a fact that all of us students had first hand experience of. We were given guidance as to how to deal with such situations in a caring and supportive manner without departing from our role of massage therapist – an important consideration for any practitioner. In summary, the course far exceeded my expectations and I would absolutely recommend this to anyone with an interest in body work. The technique not only massages your body but seems to get right down in there and massages your inner being as well – real therapy indeed. Jo set an extremely high standard of professionalism and brought a depth of wisdom and insight into her instruction which made us all feel as if we had been on a month long course instead of just a week. I will definitely be attending the next diploma course in Cape Town.